My kids live a life of privilege. They have nice clothes to wear, plenty of toys, and shelves full of books. They have access to a good education and live in a well-maintained home in a safe neighborhood. My kids never go hungry. Other kids aren’t so lucky, and I need my kids to know that. I can show them through news articles and I can tell then how lucky they are. But, I just don’t think that’s effective enough. I want to show my girls how they can help and teach them ways to make a difference in the world. Finding time to volunteer as a family is a great way to start. We don’t do it nearly enough. That needs to change. 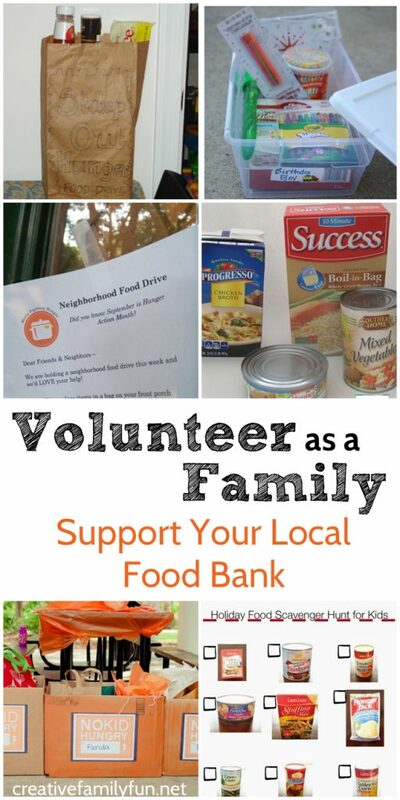 A good place to volunteer is with your local food bank. You’ll be making a difference in your own community and helping your own community is an important place to start. What if there aren’t any volunteer opportunities for your family? What if your kids are too young to help in an official capacity? Don’t give up. Just get creative! There are plenty of ways you can involve your kids in helping your local food bank. Here are ideas that are perfect for a family service project to support your local food bank. Pleasantest Thing found a great opportunity to involve their kids through a special opportunity at their local food bank. You can do something similar by taking your kids shopping for good and healthy non-perishable breakfast foods you can donate. Special treats just aren’t a reality for many families that depend on food banks. Help your kids give back to other kids by creating these simple birthday boxes from I Can Teach My Child. It’s a simple birthday party in a box, but it would mean so much to any kid. Help your child pick out a favorite recipe and then shop for the ingredients. JDaniel4’s Mom has a great idea to help your kids plan mindfully, shop, and then donate their food choices. Help make sure your local food pantry is stocked with holiday food favorites with this simple and fun activity. Frogs, Snails, and Puppy Dog Tails created a simple picture-based scavenger hunt to help their kids shop for the food pantry. This is a simple way for even your youngest kids to help. Every year the United States Postal Service does a food drive. Your family leaves food by your mailbox and a postal worker will pick it up and deliver it. The Weaving Ideas has the details you need to participate in their yearly food drive. Too many kids are not getting enough food. It’s heartbreaking. Many communities now have a backpack program where kids receive a backpack at school full of food that they can take home to help combat this hunger. Foster2Forever explains how this works at this link. You can help support this project by shopping together has a family for requested food items. Get your toddlers involved. With a lot of parental help, even your youngest kids can get in the practice of giving back. You can find some tips for involving toddlers here at Bits of Positivity. A food drive doesn’t have to be huge. 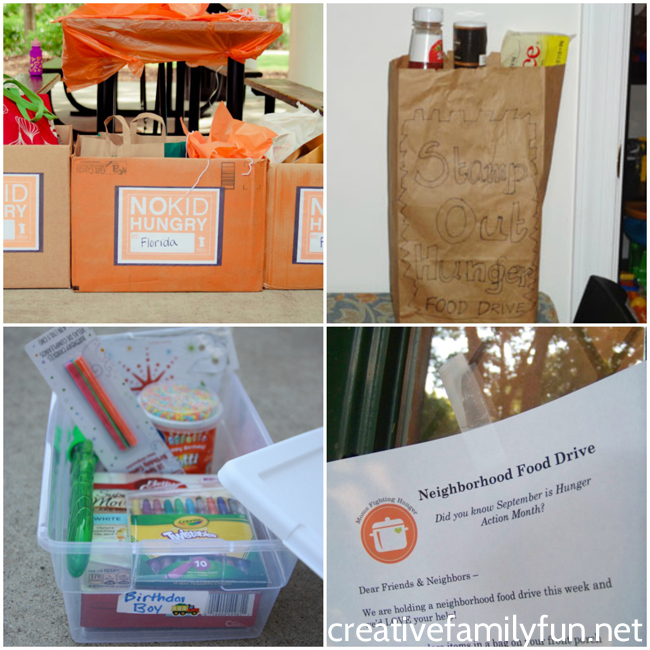 Help your kids start small with a simple food drive in their neighborhood. EDVentures With Kids shows you how. Invite a group of your child’s friends over to learn about how they can help combat hunger and collect food for your local food bank. It’s a great learning experience for all. You can find the details at Coffee Cups and Crayons. How do you support your local food bank? You can help your kids make a difference when you volunteer as a family. It can change the world one little bit at a time. My kids love lunchbox notes. It’s a little connection to me and a little connection to home. It’s a reason to smile even on the worst days. I’ve been slipping these into my girls’ lunches ever since my oldest was in 1st grade. In case you’re curious, she’s in 4th grade now. That’s a lot of lunchbox jokes. Searching Pinterest will usually yield lots of good options, but that can take time. Time that none of us have. 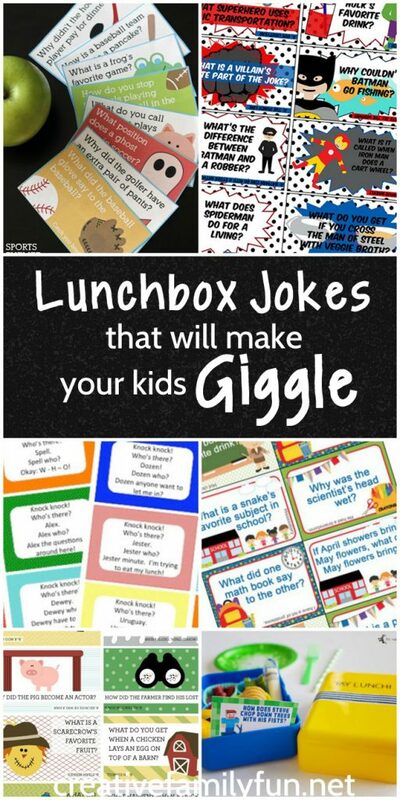 So, I thought I’d gather up some of my favorite lunchbox jokes and put them in one spot so you and I can both have easy access to these fun printables. 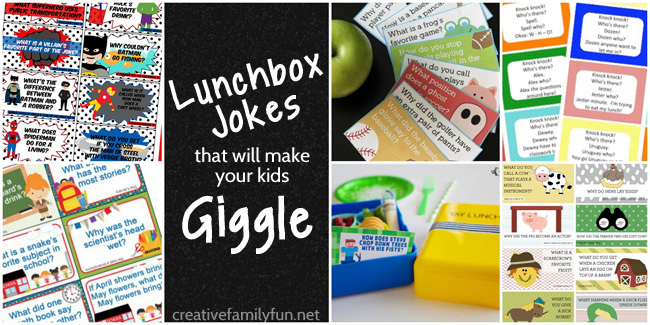 Click on the ones that look interesting, print them out, and starting slipping them in the lunch box. It’s a fun way to add a little something special to your child’s day. More School-Themed Jokes at Coupons are Great! Fun Tongue Twisters at What Do We Do All Day? Did you find any your kids will like? I know I have! Birds certainly are fun to watch, aren’t they? A house never quite feels like home to us unless we’ve got birds fluttering around. We like to attract them to our yard with bird feeders that we keep filled all year long. Most of ours are store-bought, but it’s always fun to offer a kid-made bird feeder to our feathered friends. You can buy a bird feeder, make your own, or have a combination of the two if you want a bird-friendly yard. 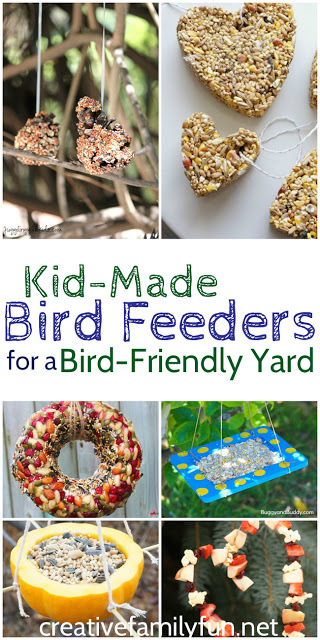 Keep reading below for some fantastic ideas for kid-made bird feeders. They’ll all attract fun feathered friends to your yard. A bird feeder doesn’t have to get more complicated than stringing bird-friendly food. This Cheerio Bird Feeder is super-easy to make and the birds love it. Add some berries and you’ve got these great Cheerio and Berry Bird Feeders from Happy Hooligans. I love how you can make them into lots of different shapes. One of my favorite simple bird feeders is a Toilet Paper Roll Bird Feeder. The Resourceful Mama shows you how to make this simple project. 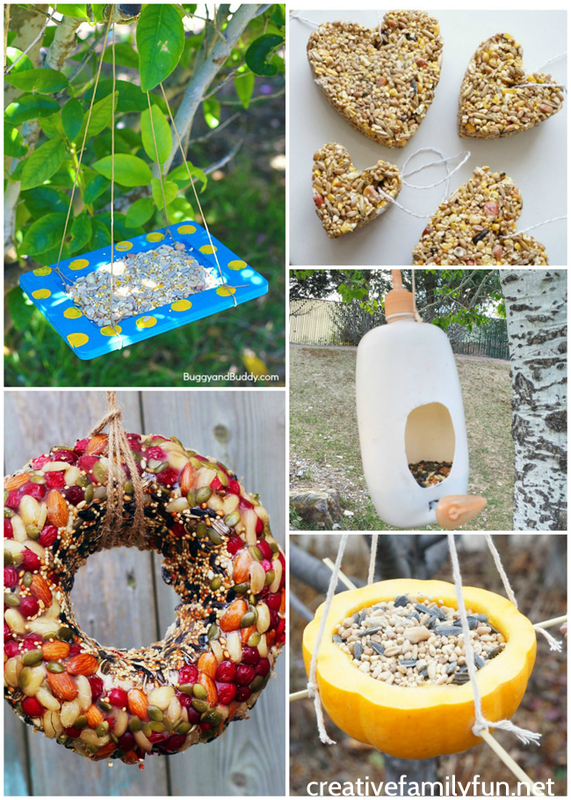 Before throwing away fruit that’s past its prime, turn it into these “Clean Out the Cupboard” Bird Feeders from Happy Hooligans. Turn a pine cone into a bird feeder. You can find the instructions for a Pine Cone Bird Feeder at Juggling With Kids. Turn a simple wooden frame from the craft store into a fun (and colorful) refillable bird feeder. You can find the instructions for Homemade Bird Feeders Using Frames at Buggy and Buddy. 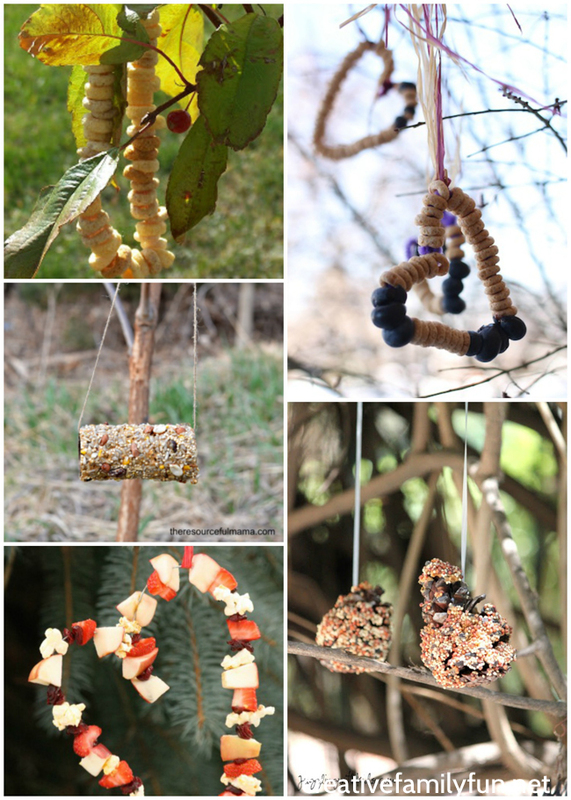 Decorate your trees with pretty shaped bird feeders. 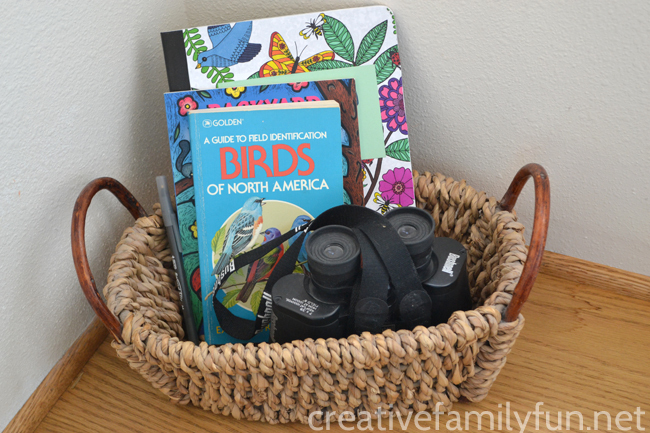 Kitchen Counter Chronicles has the instructions for these simple Cookie Cutter Bird Feeders. Clean out a lotion bottle and turn it into a bird feeder. Find out how to make this recycled bird feeder at Teach Beside Me. 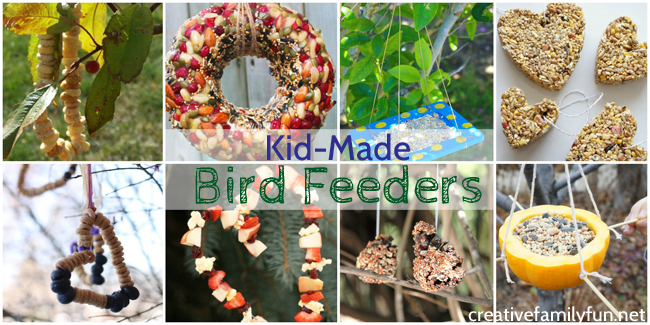 Have you ever seen those beautiful bird feeder wreaths? Did you know that it’s a project you can do with your kids? Suger, Spice, & Glitter has all the instructions you need for creating a Kid-Made Bird Feeder Wreath. Turn a gourd or small pumpkin into a bird feeder. Check out Kitchen Counter Chronicles for this pretty project. Don’t forget to keep track of all your feathered friends with a Bird Watching Journal! Does your family have any shared interest or hobbies? Do you all love to watch and play baseball? Or maybe hiking is your thing? Or do you spend the winter skiing and snowboarding? Whatever it is, a shared hobby is a great way to spend quality time together. If you don’t already have a shared interest, have you thought about trying something new together? It doesn’t have to be complicated and it doesn’t have to be expensive. I’ve got a crazy idea for you. 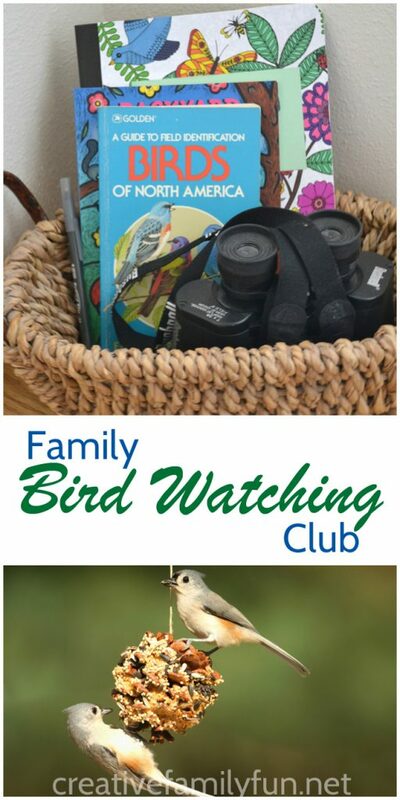 Start a Family Bird Watching Club. Hear me out. Why is bird watching a good idea? It’s simple. You may already have all the supplies you need. You can do it all over the world all year round. It gets the family outside enjoying nature. You can plan fun trips around this hobby. Anyone at any age can do it. Plus… birds are just plain fun. First, you’ll need to gather a few supplies. 1. Find a good bird field guide. We’ve had the field guide pictured above for a long, long time. It’s still very useful and we use it all the time to identify birds. Birds (A Golden Guide from St. Martin’s Press) is an updated version of our book. I also love the field guides from National Audubon Society, such as the National Audubon Society Field Guide to North American Birds: Eastern Edition. Find a field guide that will work for your area of the world. 2. Get some binoculars. You won’t always be able to see birds close-up. A good pair of binoculars is crucial to being able to see and observe birds. You don’t have to spend a lot of money, an inexpensive pair will get the job done. 3. 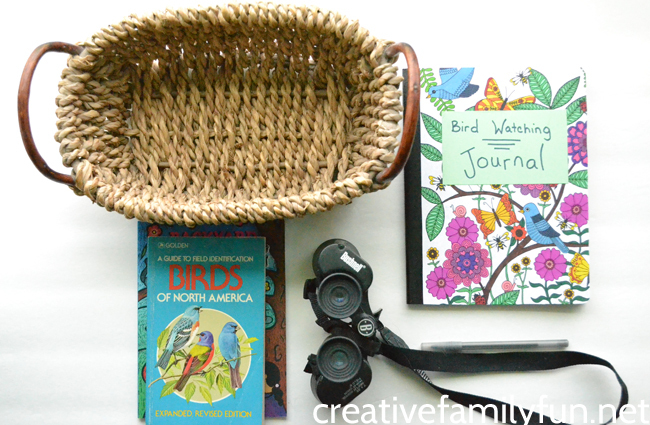 Add a bird watching journal. You’ll want to record all the cool birds you find, so you’ll want a simple Bird Watching Journal. Get a nice notebook (like a Moleskine) or follow our tutorial for a simple and colorful DIY journal (you can find the tutorial here). 4. Find a basket or container. This isn’t necessary, but it’s a nice addition. 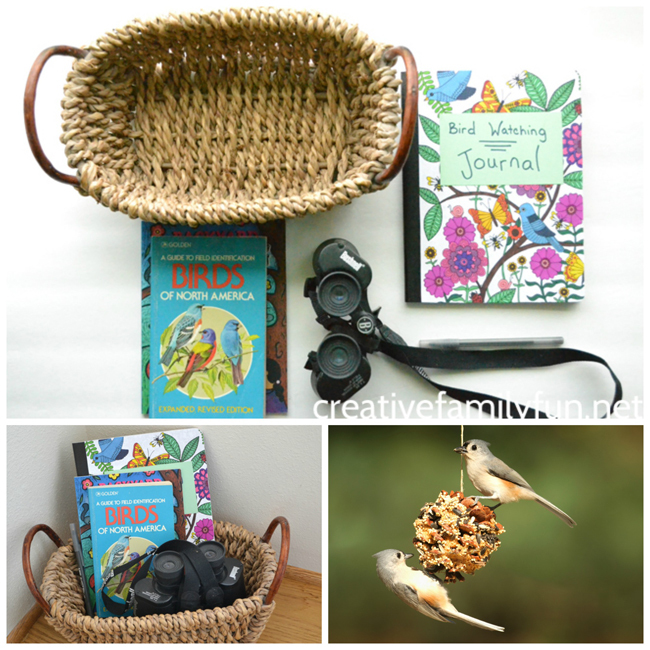 Find a basket to keep all your bird watching supplies contained. Keep it by a window (it it’s a window near a bird feeder – even better), and you’ll have easy access for everything you need. You’ve got the supplies, now what? 1. Learn about the birds that visit your own backyard. If you’re going to try bird watching, you probably want to make sure your yard is bird-friendly. Add some feeders (and keep them full) and maybe a bird bath. Try to put a feeder near a window, so you can observe the birds from inside and not disturb them. 2. Plan some trips to watch birds. You don’t have to go far. Visit a local park, pond, or nature center. Don’t forget your binoculars. 3. Keep our eyes and ears open everyday. Birds are everywhere! Once you start noticing the birds, you’ll find them all over the place. Use your field guide once you get home to identify the birds you saw. Don’t forget these important tips! 1. Don’t get too close! Stay a distance away – that’s what the binoculars are for. Let the birds go about their day without disturbing them or even trying to touch them. And, while we’re on the subject of touching, don’t try to disturb or touch a bird’s nest either. 2. Birds like it quiet. Sometimes even a little noise will scare away a bird. While observing a bird, keep it quiet and you’ll see all kinds of fascinating things. 3. Use your ears. Often you’ll hear a bird before you see one. If you hear a bird, stop, and look around. You may get lucky and find the bird you hear. If not, can you identify the bird by it’s call? Are you ready to start a new family hobby yet? Give bird watching a try once. You never know, you may find a new source of family activities. Bonus Tip: The book Backyard Birding for Kids: A Field Guide and Activities by Fran Lee is a great starting point for bird watching. You’ll find common birds, places to go, and activities to make your own yard bird-friendly. When we plan vacations, we often like to tie them around a national park. Just last summer, our main destination was Great Smoky Mountains National Park. There are so many amazing and beautiful things to see. National parks are often a big trip. What if you’re looking for a weekend away or just a day trip? That’s when it’s time to check out a state park. With over 6600 state parks located all over the United States, you’re sure to find something within a quick driving distance from your home. 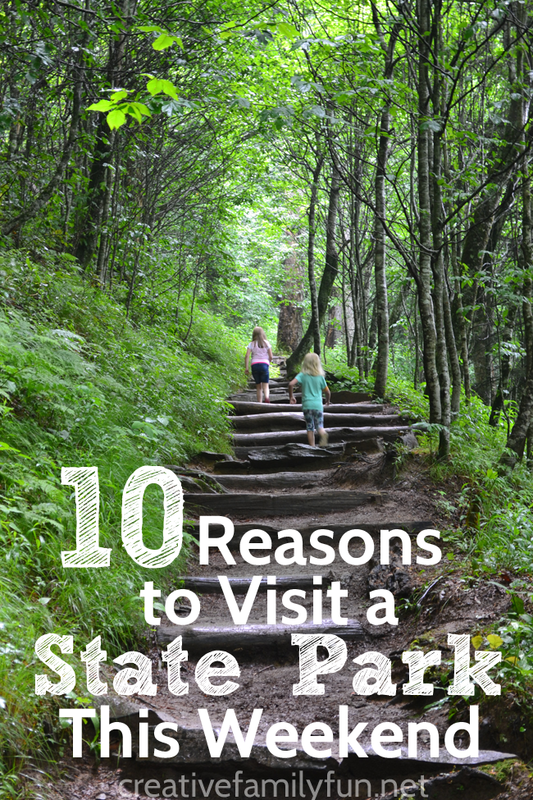 In case you need some convincing as to why you should visit a state park this weekend, I’ve got 10 reasons for you. Check them out below. 1. It’s an inexpensive way to take a day trip or a weekend away. Entrance fees vary according to location, but no matter where, it’s usually inexpensive to visit a state park, especially when you compare the cost to other tourist attractions. In many states you can even purchase an annual pass for all the parks in the state. If you plan to visit often, this is the way to go. Once you’re in the park, there are many activities that don’t have any additional costs. 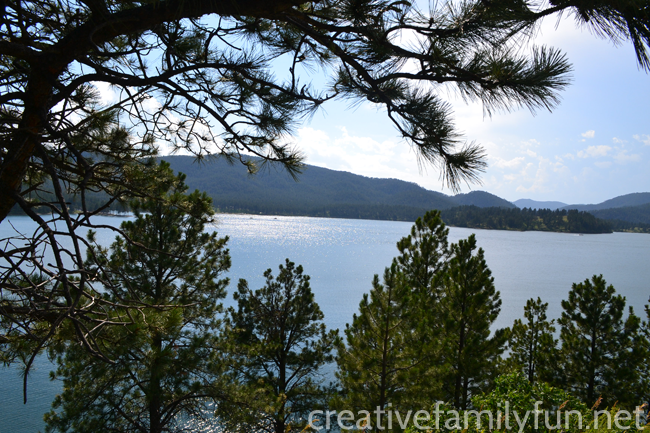 A state park really is a fun and inexpensive way to have an adventure with your family. 2. Learn about the local wildlife. 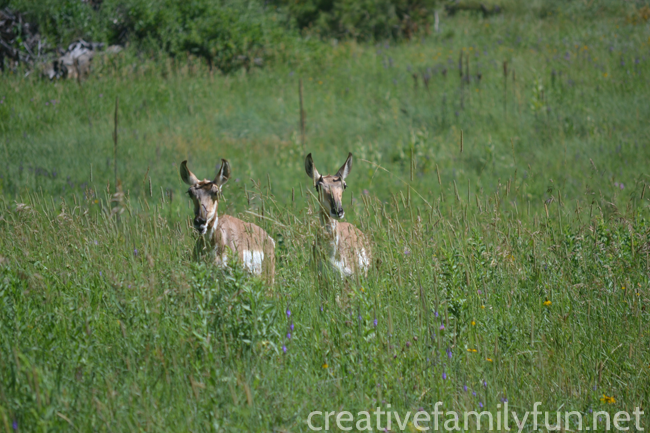 Do you want to learn about the wildlife that is native to your area? Check out your closest state park. Stop by the visitor’s center and they’ll usually have information about the wildlife you can find in the park. They’ll give you safety tips for both you and the wildlife and often will tell you the best places to see that wildlife. (Ex: Take the hiking trail around the lake and you may see or hear the family of loons that live nearby.) Even if you don’t see any animals, you’ll likely spot some of the local birds around the park. And, no matter what, you’ll definitely get a peek at the habitat that these animals call home. 3. Find hiking trails that are kid-friendly. Hiking is a such a fun activity to do together as a family and state parks are a perfect place to find kid-friendly hikes. You’ll often find short hikes that aren’t too strenuous – these are perfect for little kids. As your kids get older, you can tackle longer and more difficult trails. Hint: If you’re bringing a stroller, check to see if the park has a handicap-accessible trail. You’ll likely be able to easily bring the stroller on that trail and take even the littlest kids on a nature hike. Get the most out of your hike with these tips. 4. See unique natural wonders. We’ve seen lakes, rivers, rock formations, mountains, waterfalls, and even the headwaters of the Mississippi River in a state park. There are just so, so many amazing things to see. Did you know that even Niagara Falls is located in a state park? You will be surprised at all the natural wonders you can find in a state park. 5. Tap into the knowledge of the rangers. Do you have a question about something in the state park? Ask a ranger. Most are happy to share their knowledge with you. They’ll recommend the best places in the park to take your kids. They’ll help you best take advantage of the short time you have and They’ll answer questions about the wildlife, trees, and flowers in the park. All you have to do is ask! 6. Take advantage of free educational activities. Stop by the visitor’s center when you arrive and see what the schedule is for the day. Often, you’ll find that there are educational activities planned. The activities are as varied as the park. You may find guided hikes, lectures, films, special activities just for kids, and more. And, most of the time, these educational activities are free once you’ve paid the entrance fee to the park. 7. Learn about local history. Not only are state parks a wealth of information about nature, but they can sometimes be a wealth of information about local history. 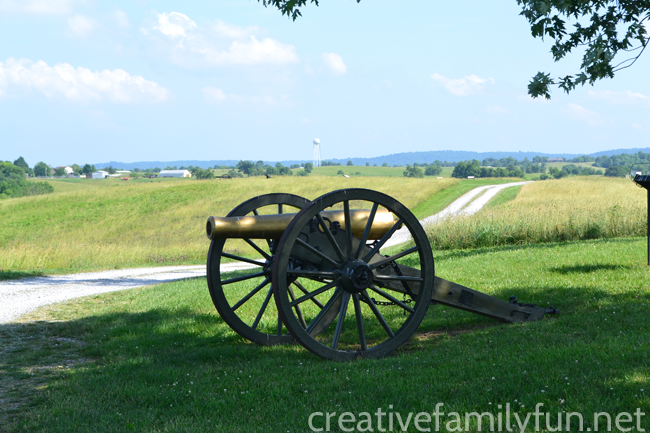 You can find Native American history, battlefields, historic homes, mills, forts, etc. There is just so much to learn! 8. Observe the night sky. Are you staying the weekend at the state park? Take advantage of the time after dark to observe the night sky. You’ll be away from all the city lights that make it hard to view the sky. So, if you’ve got a clear night, stay up a little late and do some stargazing. You can find some great tips for observing the night sky with kids here. 9. 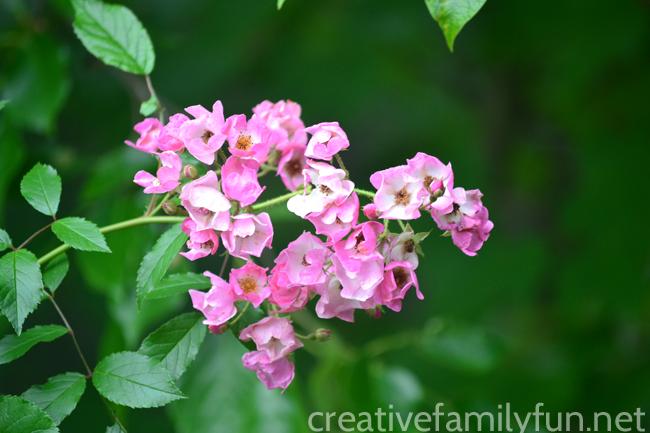 Learn about the flowers and trees native to the area. Nature abounds in a state park. Many times, if you stop by the visitor’s center, you’ll find brochures about the local trees and wildflowers. Grab a set to take along on your hikes. One of my favorite things to do is to see just how many of the native wildflowers I can find on a trip. You may also notice labels along hiking trails to help you identify the trees, shrubs, and flowers along the way. 10. Experience outdoor activities. There are so many outdoor activities that are fun to do together as a family and state parks are a great place to try some of these activities. Go fishing, rent a canoe, camp overnight, or go on a hike. Not only is the location perfect, but you may also find educational opportunities to learn about a new outdoor hobby. Are you convinced yet? State parks are perfect locations for a family adventure. Find one nearby and check it out. I wrote this post in conjunction with Kids to Park Day, taking place on May 21, 2016. The National Park Trust is encouraging everyone to get out a visit a park (national, state, or local) this Saturday. You can find a map of all the activities taking place all over the country here. Find a local activity and sign up on the main page here to show that you’re attending. The goal is to have 750,000 people attending all over the country! Will you join us in attending?